I was so pleased with the lessons today over at Summer Card Camp 2. I'm busy, I've got 4 lovely ladies coming over for a Silhouette Cameo class on Saturday and I need to get my house in order! Now, I'm not one to make excuses, so my home will be clean and my class homework will by up-to-date! So today's challenge was to make a card in 10 mins - perfect! The lovely Kristina suggested using our die cutting equipment to make things quick! 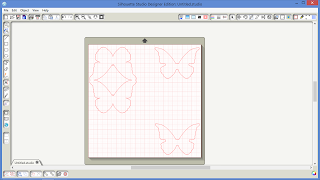 I thought, for a moment, that I would be at a disadvantage using my Silhouette Cameo, but of course I wasn't, it's was super quick, once I decided I was going to use a butterfly image, one I'd had from the on-line store for quite a while! I hadn't thought I'd have time in just ten mins to stamp the inside, but as the stamp was out any way it only took seconds! ...it was easy to make the base card, I just sized my butterfly and mirrored the image above, selected it and moved down just a couple of clicks on my down arrow, which was enough to weld both into a card shape. I did an internal offset of the original butterfly to make the mat on the front and whilst I was at it, I made a copy for the inside! You can see from the screen shot above I was able to cut all the pieces at once - it took moments! Whilst my Cameo was doing the cutting I was punching the leaf, flower and mat for the sentiment. I also stamped the sentiment before I took the images off my mat. I stuck it all together and finished the card in a record time of 8.39 mins! 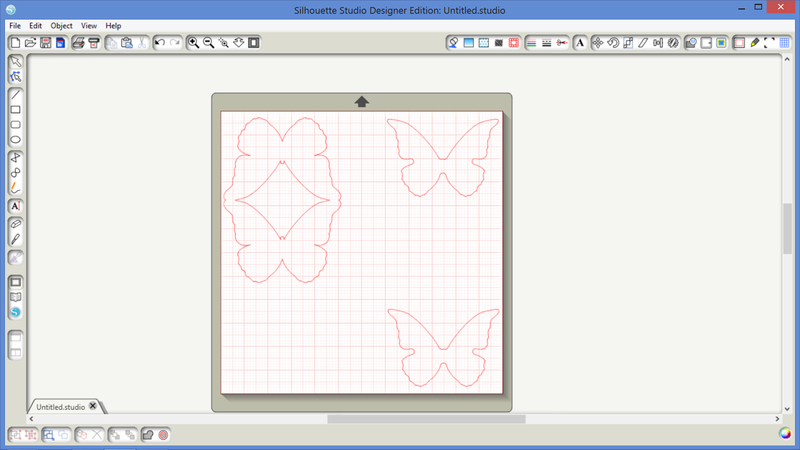 Of course I will save my workings in the Silhouette Software so that I can make another card even quicker next time! Right, I need to tidy my desk, clear my dining room table and get my computer and Silhouette Cameo down there ready for Saturday! Gorgeous card. Good job. I don't know if I'll be able to do it in 10 minutes but I'll try this weekend. Amazing how fast those 10 minutes tick by, huh? Your card is amazing! Oh wow!! I LOVE this!! I wanted to do a shape but knew it would take me more then 10 minutes to set it up on my Silhouette. I wish I could take your class!! Beautiful card!! Butterflies are special for me so I LOVED seeing your shape card. Great job. Wow, you are quick! I'd never be able to do this so fast with the Silhouette-- I'm still such a beginner. A butterfly really makes an extra special shape for a card. Wonderful idea and with a few swipes of ink and stamps, you made a beautiful card! Oh dear! I really do need a cameo don't I? I love your gorgeous butterfly card, in fact I really like all the cards you've done for the class so far. You've inspired me to make use of my Cameo for one of the homeworks soon! You mention in an earlier post that you used stencil vinyl - is that ordinary vinyl or is it thicker for stencils?